Locke and I were trying to come up with a comic when he said that we couldn’t do any video game comics because he currently has no games to play. 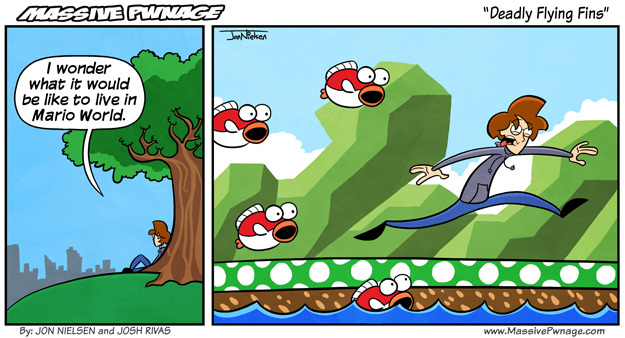 I suggested doing a joke about an older game and Locke got the imagery of Ence running from those dang fish from Super Mario World. This entry was posted on Monday, September 6th, 2010 at 12:00 am and is filed under Comics. You can follow any responses to this entry through the RSS 2.0 feed. Both comments and pings are currently closed. I wonder how those fish actually bounce on land, not being in water….not that you can bounce in water anyway. OH GOD MY ARM! OH GOD THE PAIN! OH GOD! OH NO! Now THOSE are evil fish.